Sometimes when issues arise in a workplace, there’s a belief that managers and teams are not on the same page — that, in fact, they want very different things. This (understandably) can cause a great deal of work stress on both sides of the equation. Managers feel like the organizational goals aren’t being met, and employees feel as if they’re not being listened to and understood. These problems do occur; they are real. But if your organization has clear goals for a given year, the relationship between employees and managers can become simplified. Team members have the obligation to help their leader succeed, and leaders have the obligation to place team members in roles to succeed themselves (and as a group). It’s a two-way street in the managerial relationship when it works well. 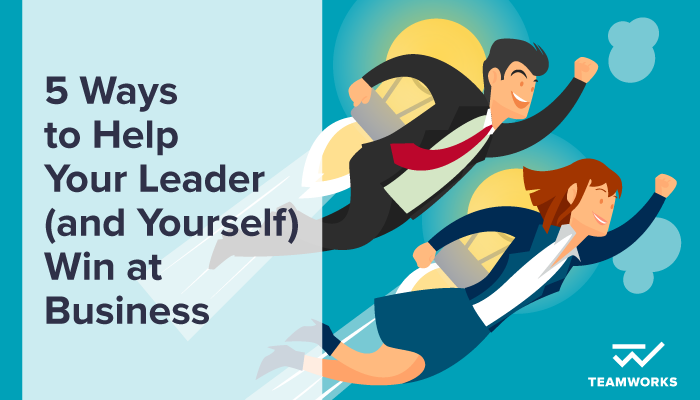 So, how do you help your leader to win — and record a few wins yourself (and for your team) in the process? See just above where we noted “… if your organization has clear goals for a given year?” For some organizations that’s a big IF. We know from scads of research on the subject that not all organizations have clear goals or an action plan. Even when they do, there can be significant problems aligning strategy (big thinking) with execution (daily tasks), and sometimes even challenges with aligning priorities (what gets worked on when) issues too. If these aspects of the business aren’t aligned, nothing that comes after this point – including your strategic plan — will work as well as you want it to. Now, “alignment” typically begins with the leader — but as a team member you can help the organization become more aligned. Ask clarifying questions about the strategy or whether Project A is more, or less, important than Project B. Seek out examples of the core values being demonstrated well throughout the team. Openly ask questions about philosophy or the “why” that drives the organization. Managers throughout the organization should, ideally, be receptive to these conversations. The ultimate goal here is twofold: first, everyone should know what needs to be done and when it needs to be done (strategic/priority alignment) second, you should aim to double your available time and cut your logistical tasks in half. To build a shared game plan, your organization or team needs to conduct market research to understand your position, define the scope of your project, talk to customers/partners, assess processes and best practices and set activities and timelines. So-called “shallow work” will always exist on project teams, but if that’s all you’re doing, it’s not helping your leader or team win. James Allen, a partner in Bain Capital’s London office, wrote an article for Harvard Business Review called “How The Best CEOs Get The Important Work Done.” Here’s an interesting insight Allen uncovered: the No. 1 thing — by far — that takes leaders off their game is dealing with bickering and infighting among team members. Even if you don’t like a colleague, constantly bringing that problem to the surface actually brings down everyone, not just you and the colleague in question. We’ve all experienced the boss who suddenly deems 44 different projects and tasks as urgent or favours the phrase, “I needed this yesterday.” That’s not a realistic manager. It may be an achievement-centric manager — which could be a good thing — but if the manager can’t be realistic, the goals won’t be met. This is an important factor in the mutual success of a leader and their team, that often isn’t built into team architecture models. Over the years I’ve witnessed teams that constantly hit all their goals — and even exceed them – only to have 2 out of the 10 team members get recognition or compensation for their efforts. Whereas the leader always received some kind of bonus. Just by the sheer nature of how their organization was structured, those higher up a hierarchy ladder were rewarded when projects in their area were successful. But a front-line employee is not always guaranteed the same rewards. A more holistic compensation model is better for the team members, the leaders and the company. To ensure the model is balanced it must be structured to: (a) reward positive behavior, and (b) find a way to reward as many people on a successful team as possible. The very nature of hierarchy means that the people with the power — the team leaders — tend to set and direct the discussion around salary and compensation. This is the norm, but it can be a two-way street. Team members and employees can ask what compensation models the company uses. They can ask how the math is determined at different levels, and they can even ask about margins as regards salary. (There is sometimes confusion that your salary only needs to reflect your value back to the company, but that’s not often how salary is determined actually.) Asking questions and starting conversations about money is often not encouraged at companies — and that’s why many studies show that people have no idea if they’re paid fairly — but as an employee if you don’t feel you’re being fairly compensated, it’s up to you to drive the conversation and ask questions around this crucial topic. In short: don’t be afraid to leave. If you don’t respect or trust your leader, move on. If they don’t respect or trust you, try to confront that issue head on — try to improve it — and if it’s headed nowhere, it’s time to move on as well. Your professional life will essentially run in circles on a series of teams where you don’t respect the leader of the team. We know there can be some amount of distrust between those who run institutions and those who work for them, and this distrust can manifest at the micro level between leaders and their teams, causing widespread failure. By some measure, 82 percent of team leaders end up being the wrong choice for that project. Those leaders fail for a variety of reasons, often because of some of the issues we’ve discussed here today. As a team member you can help your leader and your team win more often when you consider the areas mentioned above. Teams need to help their leaders “win” at the task in front of everyone, and leaders need to help position their teams for success too. Whether or not this is happening in your organization could speak to its overall health. For decades companies have been meticulously attending to the details of their financials, sometimes assessing them daily in executive meetings. This often creates a blind spot to the other aspects of their business that produce real success. That’s often still the case, but gradually we’re seeing more and more companies look at all of the factors that compound to create their success. If you think organizational health is something you need to be concerned with (hint: it is, for almost every company), then … what do you need to look for? We put together a checklist of considerations on organizational health, which you can download for free below. Take the checklist to your next meeting with your leader and spark a new conversation around how you can all help to improve the health of your organization so that you can both win more often.